Used to be that A Farewell To Arms couldn't be seen complete. Prints were gelded and dim besides. I didn't even want to watch what UHF channels broadcast in the 70's after the Paramount 1932 version went apparent PD. What brought this to recent attention? A TCM view of Warners' called-by-some remake, Force Of Arms, which it isn't, but close enough being so for WB to hedge bets (and forestall Hemingway legal challenge) by owning the Farewell property, which they'd later barter to Selznick for his '57 re-do. Confused yet? Might be my addled prose, or fact that 1932's A Farewell To Arms walked through fire toward at-last recovered completeness in first a 2004 Image DVD, then Blu-Ray splendor more recently from Kino. That rescue was serendipity made possible by a Selznick-saved print of the original before it was Code-cut in 1938 (DOS saved everything), just another reason why we should revere him. What I'm about here and in Part Two is back-track through Farewell's thicket from '32 to happy High-Def place it today occupies. 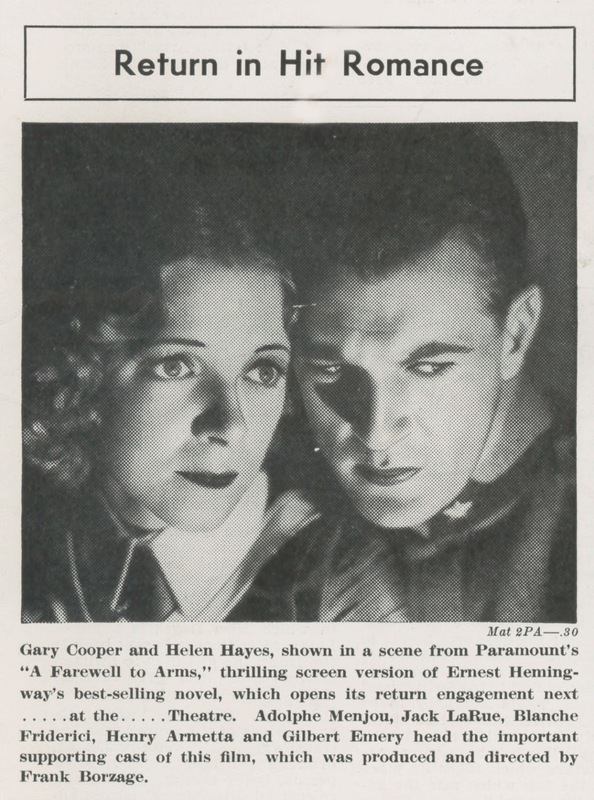 A Farewell To Arms had been considered a classic right from start, being one of Paramount's (few) hits in an otherwise depleted 1932. 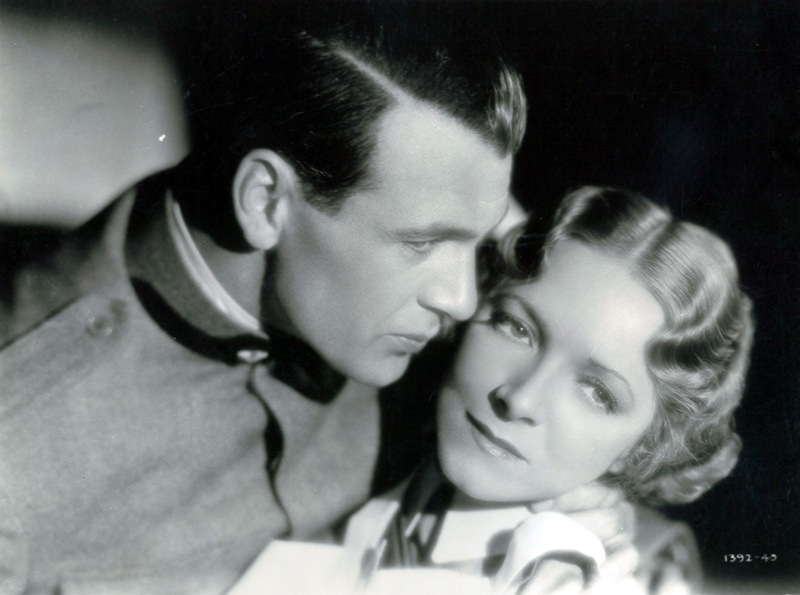 Old man Depression couldn't stop director Frank Borgaze's romantic steer of Gary Cooper-Helen Hayes into moviegoer memories; they'd treasure time spent with the pair and ask for repeat engagements, accommodated so long as exchanges had stock. Forward to May 1938: Product is industry-wide low (a bereft summer was looming) and majors look to revival of past hits to fill scheduling. Dracula and Frankenstein come back to unexpected crowds. 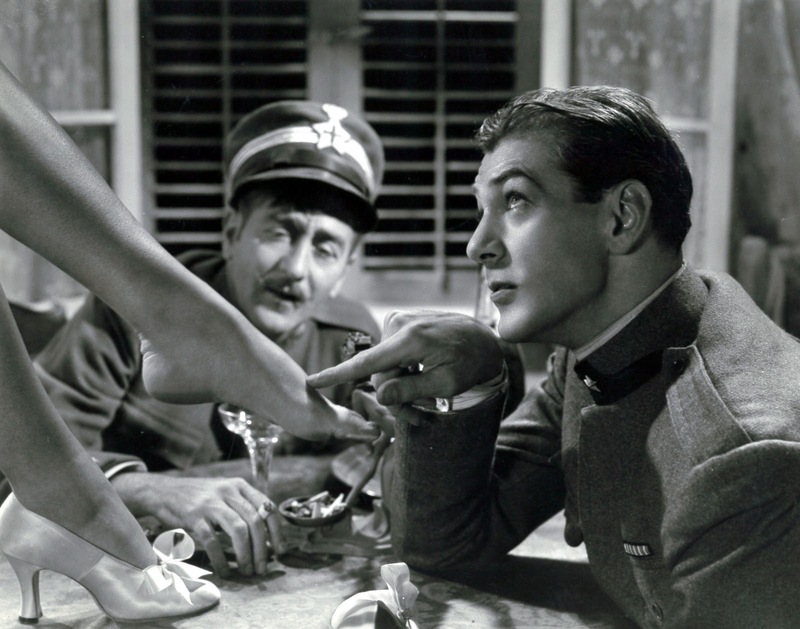 Even Valentino's two Sheik silents return to satisfaction of a talkie public's curiosity. Paramount had clicked with recent encore of The Virginian, a Gary Cooper (very) oldie folks still talked about; that was good for what Variety called a "found" $170K. Could A Farewell To Arms, even better regarded, go a more profitable distance? What stoked potential was Helen Hayes wowing legit-goers as Victoria Regina, the play just off a sock Broadway run and now touring as new Farewell prints were prepped. These first had to go before PCA authority for a '38 Seal of Approval, censor-speak for Farewell's head upon a butcher's block. How deep was the chop? Well, enough to ruin what Borgaze and crew had effected in 1932, and that had only come after intense wrangling with so-called precode authority (headed then by easier-going Jason Joy). Still, A Farewell To Arms had cache and maybe renewed relevance now that a world seemed newly bent toward war. 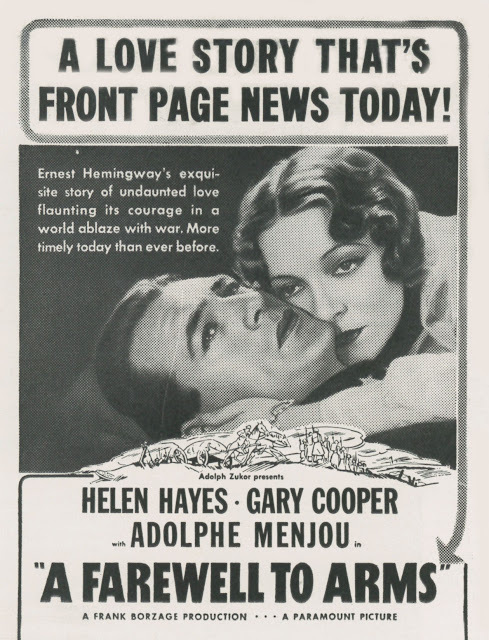 Variety headlined on 5/31/38 that AFTA Will Be Given Same Bally As (A) New Film, which meant heavy exploitation, local press previews, the works. Toward getting back coin spent, Para set a straight 20% of receipts as toll for theatres playing their (200 new prints) revival. What would hopefully help too was "Queen Of The American Stage" Helen Hayes pitching in with a boost, Para publicity chief Terry DeLapp dispatched to Frisco where she'd preview, Variety said, a slightly deleted print ... to see if, in her opinion, the expurgations ordered by the Hays office were in any way objectionable. 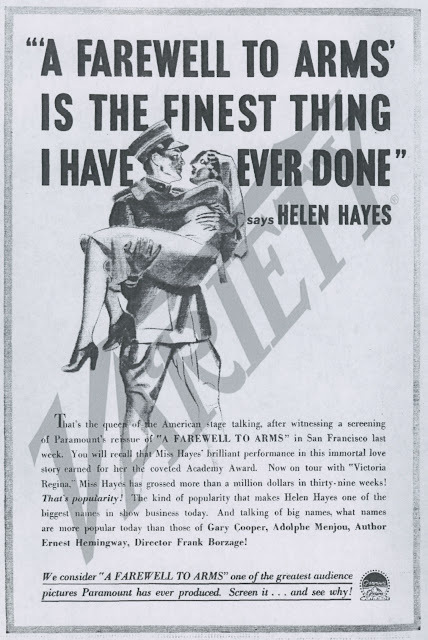 Maybe Helen's memory of the original was cloudy, or she just decided to play ball ... either way, a trade ad ran her endorsement: "A Farewell To Arms Is The Finest Thing I Have Ever Done." The trade a week later pointed out humorous aspect of Victoria Regina having its LA run in direct opposition to A Farewell To Arms a block away. Helen Hayes was competing with herself! Film house booking is not expected to cut into her legit performance take, assured a columnist, and how true those words turned out to be, as Farewell's comeback went disastrously with a brutal $1,500 in the till for its first two days. Were visiting Shriners in front of the theatre and crowding street corners responsible? --- or was it fact that patrons are just not interested in viewing a reissue that has previously been thoroughly milked in the nabe subsequent runs. Paramount forged ahead, engaging in ticklish negotiation with the Italian government for permission to release A Farewell To Arms in that fascist stronghold. "Satisfactory agreement" was reached in September, the country's spokesman issuing a statement that Fascists do not believe reflections on Italy or scenes distasteful to Rome were intentional. 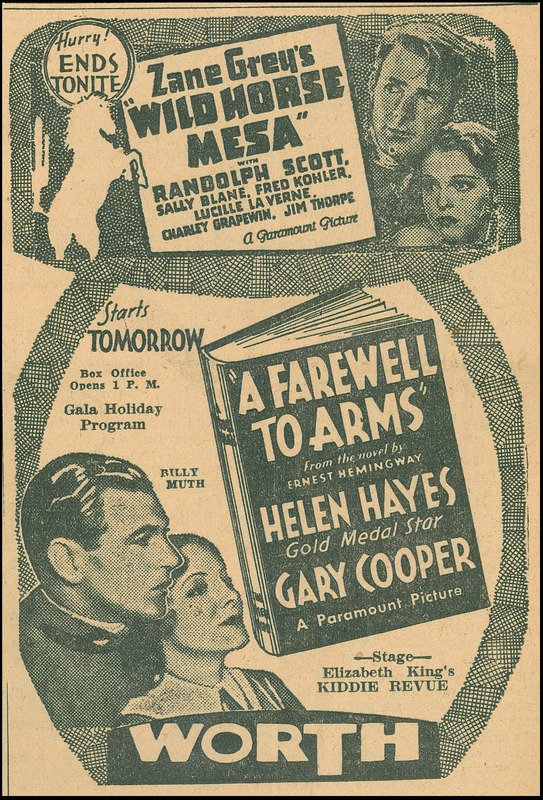 Variety's 1938 year-end biz summary ID'ed a "Death Knell" for reissues: While the revival of old films in some cases registered modest profits for their makers, the "take" was trivial when compared with the customer resentment that developed in some sections of the country. So back into storage went A Farewell To Arms, never to be reissued by Paramount again ... but vault-bound to stay? Not hardly.